The listing agent’s photos—including a computer rendering of the kitchen updated with stain- less steel appliances, Nelson bubble lamps and gray upholstery on the banquette—garnered online chatter when posted on retrorenovation.com. “I was really happy to be able to share that the right buyer had, indeed, purchased the home and would absolutely maintain it, maybe even better it,” Starelli says. The home’s appliances were all GE electric models, and only the dishwasher remains. “The fact that the original owner died fairly early and his wife didn’t want to change anything preserved the house,” says homeowner Bobby Brom. 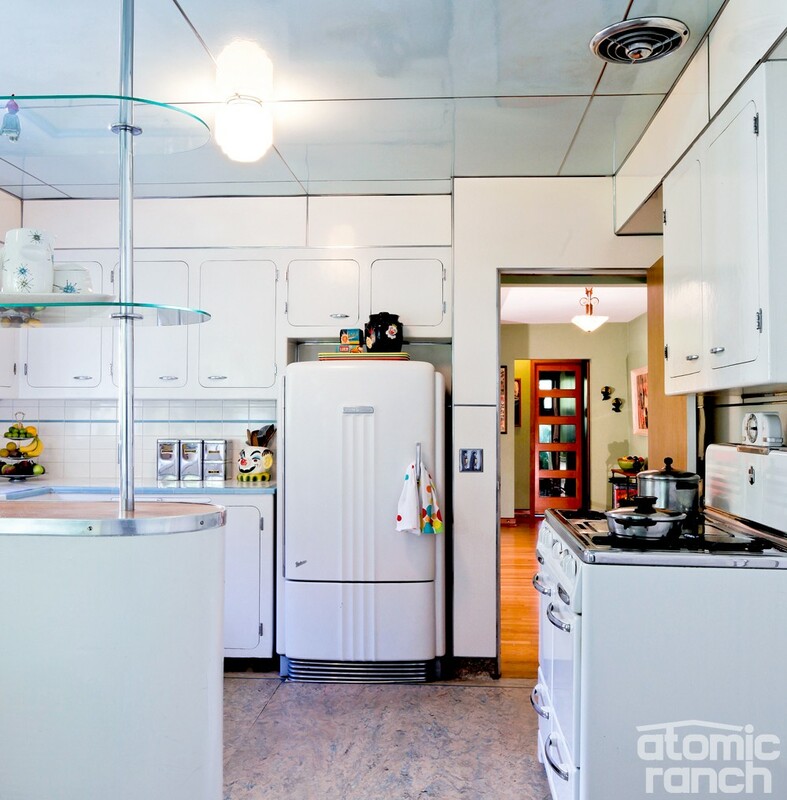 “Most ads for early dishwashers show stand-alone models, not built-in ones with a combined sink like ours.” Both the gas Wedgewood stove, and the replacement GE fridge date from 1948. While the dishwasher does work, it has some issues including rust and a deteriorating seal, so the Broms hand wash and use it as a drainer. There are videos on YouTube that show they’re not the only enthusiasts devoted to babying old appliances like this. The Broms had lived in Saint Louis, in Austin (coincidentally, down the street from the Rollingwood house on page 12) for 15 years, and in a ’30s home in Washington, D.C., moves dictated by Bobby’s Air Force career. But Marti, an Americana recording artist, had embraced retro from the time she worked in a vintage clothing shop 35 years ago. When Marti was working at Dillard’s she chose this bedroom suite for its vintage aesthetic and sound modern construction. The zebra-print slipper chair is contemporary and the collectibles include Bakelite and rhinestone bracelets, costume jewelry and Madonna statues. For many years Marti worked as a department store visual merchandiser—designing window displays and furniture vignettes, dressing mannequins—and she annually visits Austin, where she decorates clients’ homes for the holidays. But she still loves best working with and repurposing found retro objects. “I always have jungle-y living rooms. The house we rented in D.C. was built in the ’30s and it looked like a big lodge inside. There, I kind of went with ‘African Lodge,’ and it worked,” she says. 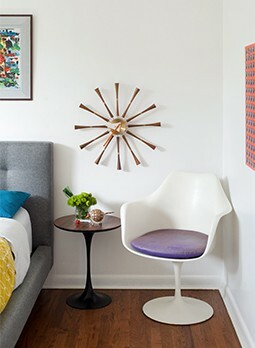 “Our ’60s Stenger house in Austin was a place where we could showcase all of our collections. I had a circus room that had clown stuff, and my rattan furniture was in there. We had another room that was just records with big circus banners; we don’t have a place to hang those here. My kitchen was bright green with yellow cabinets and Day of the Dead collectibles. In this kitchen I had to tone it down, and I can’t hang anything on the walls,” Marti explains. A new house means a new design concept. Learn how Marti and Bobby’s respective collections have been adapted to the space in Part 3.